Join Us For A Full Day Of Battery-Charging, Sales-Generating Strategies, Tools And Discussion! Fair Warning: Because we want to facilitate meaningful conversations and Q&A around marketing implementation and best practices in list building, lead generation, CRM implementation, sales process and a number of other key topics, we are limiting these events to only 50 seats per location. Seats will go fast, so make sure to register immediately! YOU'LL LEARN THE 5 FASTEST, MOST EFFECTIVE METHODS THAT ARE WORKING RIGHT NOW FOR GETTING MORE NEW CLIENTS AND CLOSING MORE REVENUE. We're going to GIVE you a deep dive into the top campaigns our clients are using RIGHT NOW to secure appointments with new prospects to sell managed services solutions, cloud solutions, security and backup solutions, network upgrades and other IT projects and services. For example, you will learn how to quickly and easily build a highly responsive list that brings you consistent leads direct from your marketing. You'll also learn how to use an automated marketing system to keep your prospects engaged and to ensure that you are top-of-mind. Want more? 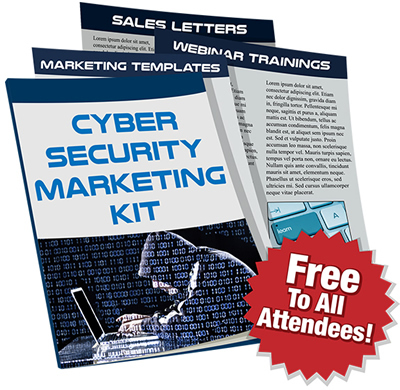 How about a webinar/seminar campaign that has helped tons of my clients generate a windfall of sales to the tune of $83,000 to $230,000 in services, capitalizing on the cybersecurity trend? If you are struggling to find ways to get more appointments, these campaigns alone (which we'll GIVE you) will make it worth attending. YOU'LL LEARN THE SECRET THAT WILL "FORCE" YOU TO FINALLY GET YOUR MARKETING DONE. One of the biggest challenges our clients face is that they're pressed for time and pulled in many directions. Fires pop up all day long, and it's WAY TOO EASY to put marketing on the back burner. You slip into thinking that you'll market "tomorrow" but tomorrow NEVER comes. At this event, we'll share the secret that other successful entrepreneurs use every single month to get their marketing done. Hint: this is about as close to "set it and forget it" as marketing can get. YOU'LL LEARN HOW TO IMPLEMENT A REPEATABLE, PREDICTABLE SYSTEM FOR CLIENT ACQUISITION AND FUELING SALES. Most people "try" things to market their IT services business. They spend hard-earned money and precious time on marketing attempts they "hope" will work, only to be disappointed time and time again. In this workshop, We'll show you how to systematize and automate marketing and selling so you can HIRE SOMEONE TO DO IT FOR YOU SUCCESSFULLY. You need to create the system, but once you have the process nailed down, you can free yourself from having to do the detailed implementation. YOU'LL GET EVERY QUESTION YOU HAVE ABOUT MARKETING YOUR BUSINESS ANSWERED. We are going to spend EIGHT FULL HOURS with you answering every single question you have about marketing, selling and fueling profits – and you'll leave with a clear, actionable plan of what to do, with all the templates, tools, direction and resources you need to get it DONE. We'll leave no stone unturned, so when you get back to your office, you can actually hit the ground running in boosting sales. YOU'LL GET TO TALK TO AND LEARN FROM OTHER HIGHLY SUCCESSFUL IT BUSINESS OWNERS. You know there is nothing quite as powerful as getting together with highly successful peers WHO ARE ALREADY ACHIEVING THE RESULTS YOU WANT TO ACHIEVE so that you can learn exactly what they are doing and how they are doing it. At this event, my best and brightest "students" will be in attendance, discussing what new opportunities are trending up in the IT services industry, what services and markets are HOT right now and what NEW vendors hold the key to additional sales and profits. You won't learn this information sitting at home by yourself staring at the same four walls. If nothing else, this is a dirt-cheap way to recharge your batteries and brush up on your marketing skills. Of course, you can count on us to deliver EXTREME VALUE and get you fired up, refocused and excited to make some REAL money! "You're Doing Yourself A Disservice By Not Taking Advantage Of The Meet Ups"